Guelph Youth Singers (GYS) is an award winning choir with deep roots in our community for 28 years! 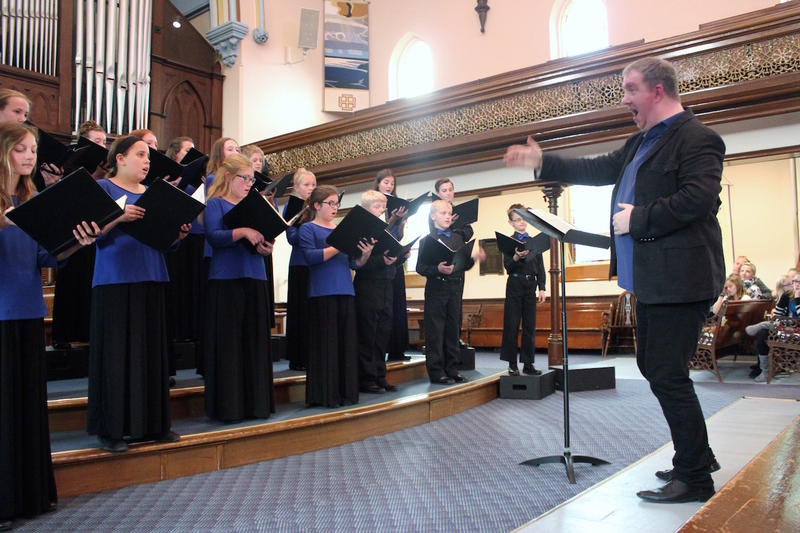 GYS works to build choral excellence in Guelph by developing the artistic soul and musical skills of children and youth. Audiences in Guelph are delighted when they hear our 90 young choristers. Our recordings are sold throughout North America and beyond, and have branded Guelph as a city that values the arts and produces an excellent product. If you love to sing, we have a choir for you! Ask about our reduced rate for university/college students in our Choir! Call for details and to book an audition. Choir 1 will continue on Tuesdays from 4:15-5:45 p.m. for our youngest and newest singers. The introduction of Dalcroze Eurythmics, a method of building innate musicality though movement, rhythm and improvisation will be an exciting addition to our programming! Choir 2 will remain on Tuesdays from 6-8 p.m. Drumming and movement will enhance a season of choral repertoire from around the world. Guest leaders will join us from the Universities of Guelph and Laurier, and the greater Guelph arts community. Cantabile, Choir 3 and Chamber Choir will maintain their Wednesday time slots. Collaborations with dance and theatre companies, and the Guelph Symphony promise to offer a season that maintains the highest of choral standards while exploring multidisciplinary performing opportunities. NEW THIS SEASON: Young Men’s Choir: Tuesdays 4-5:30 p.m. Geared towards the bravest of us all, the changing male voice will be nurtured and challenged in this high-energy 90 minute vocal session. Exploring repertoire from folk, to light pop and more traditional styles, GYS will guarantee a high standard in a safe environment filled with tons of fun! (Gentlemen are welcome to sing in other core choirs, like Choir 3 upon the approval of the artistic staff). NEW THIS SEASON: Music Theatre Academy: Sundays 2-5 p.m. Our newest program in GYS is the establishment of the Music Theatre Academy, structured around the programming of two of Canada’s finest youth theatre companies. Geared towards young performers who are looking for an elevated theatre performance experience, the small group will work with Markus and other professionals from the Central Ontario theatre community. Solo and small ensemble singing, drama, and dance will be the core disciplines in a weekly intensive. More information will come as guest artists and performance dates are finalized. NEW THIS SEASON: sheVoce: Wednesdays 4-6 p.m. Until we can find a balanced number of changed male voices to resurrect our amazing SATB Choir, sheVoce will be an all-treble ensemble of the most experienced singers from GYS. Geared towards auditioned voices mainly in grades 11 and 12, this advanced ensemble will explore music from the Contemporary Songbook. The Good Lovelies, Sweet Honey on the Rock, and VOCO will inspire our small ensemble singing, mentored this season by members of the professional choir LA MOVIDA! To our Sponsors and many Donors! Markus Howard became the second ever artistic director of the choir in 2013. Read more about his accomplishments here!